Stop by today for the best lunch in town! When you're on lunch break, you're pressed for time and want quick food and fast. The Jacksonville, NC area is proud to introduce Jeff's Burgers Dogs & Shakes for the best lunch around. Established in 2002, we offer you a comfortable, laid-back atmosphere. We make most of our delicious plates by scratch and add our own flare of seasoning to make you wanting more after each bite. This take-out restaurant us unlike any other, because we hand patty our burgers daily with silver ground chuck, and cut our steak and chicken fresh. Our lunch menu is known to be extensive, from burgers to philly cheese steak sandwiches. Now doesn't that sound like the best lunch you could ask for? We serve quick food at any time! Jeff's Burgers Dogs & Shakes is a local favorite of the Jacksonville, NC citizens. Everyone and anyone is welcome to stop by and try our delicious quick food. One of our favorites is our homemade clam chowder that is filled with fresh, juicy clams. We also recommend the Flounder Sandwich, a lightly breaded flounder filet served on a soft bun with tartar sauce. Don't leave without trying our dessert, a hand-mixed milkshake! Our take-out restaurant is cooked to order, so you know you're getting the freshest food in the area. Visit Us for The Best Lunch Around! If you need a place to go for the best lunch, then look no further than Jeff’s Burgers, Dogs & Shakes. 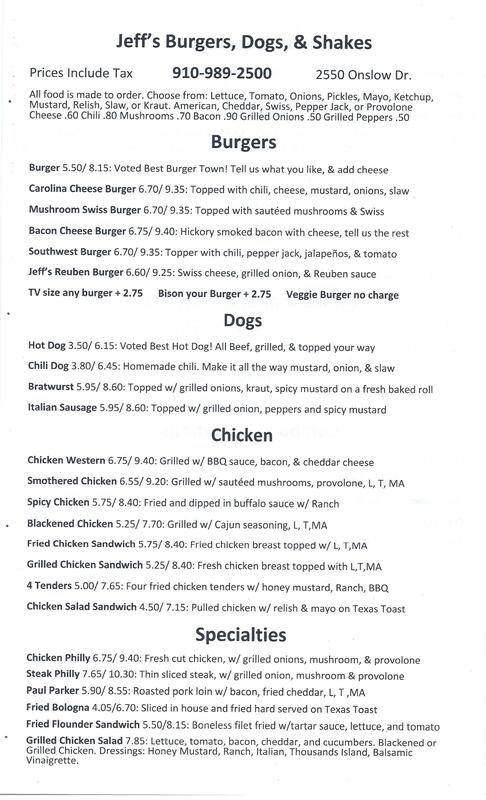 Our exciting lunch menu includes options like mouthwatering burgers, sandwiches, hot dogs, steaks, fish, and more. 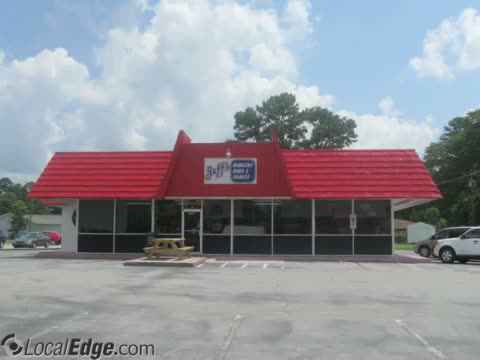 If you want to treat your family or friends to the best lunch menu around or you need a place to go on your lunch break for a quick bite, we are the restaurant in Jacksonville, NC to go to! We serve fresh and delicious food including mouthwatering burgers, sandwiches, drinks and desserts, and more! If you are looking for a restaurant near Jacksonville, NC that serves the best lunch at budget-friendly prices, we have you covered. Our burgers are popular across town, and once you taste them, you’ll see why. You will also love our ambiance as much as our delicious food. Visit our restaurant with your family and friends to enjoy the best lunch! If you're passing through Jacksonville, NC and in need of quick food with quality taste, make Jeff's Burgers Dogs & Shakes your first pit stop. We encourage everyone to order from our take-out restaurant and try our delicious hamburgers and french fries. There are so many options to satisfy your taste buds. You will walk away feeling satisfied in every way after you try one of our chicken salad sandwiches or flounder filets. We want you to spread the word that we are the best lunch in town! 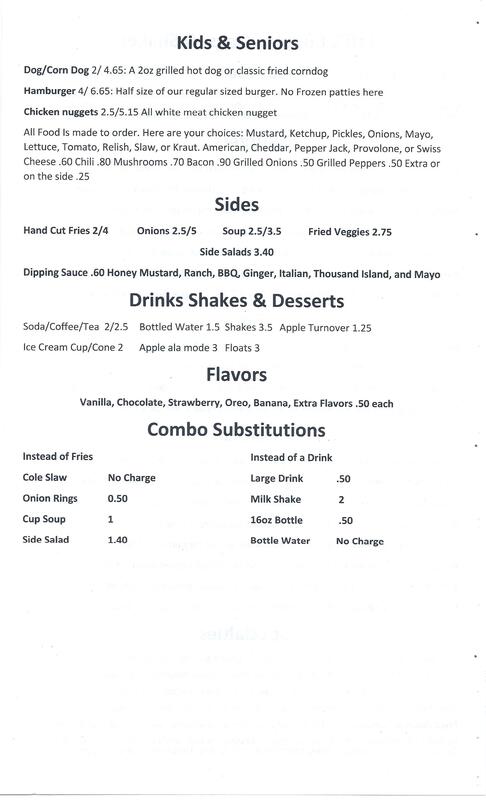 Lunch & Dinner: Hand pattied burgers, Philly cheese steaks, Chicken sandwiches, Chicken salad, Flounder sandwich, Bratwurst, Italian sausage, Fried bologna sandwich, Soup, Salads, Chili, Handmade milk shakes.